Normandy Park native Brittany McPhee is playing in the final Pac-12 tournament of her career at KeyArena. She's played many memorable college games in Seattle, but one sticks out more vividly than all the others. In four years at Stanford, senior guard Brittany McPhee played in her hometown of Seattle with the Cardinal on multiple occasions and won two Pac-12 tournament titles Key Arena. But ask the Normandy Park native to name her most memorable college basketball moment in Seattle, and she points immediately to the Cardinal’s 72-68 regular season win over UW at Alaska Airlines Arena last season. The Cardinal battled the Kelsey Plum-led Huskies in front of a sold-out crowd of 10,000 that day, engineering an 18-point comeback to upset No. 7 UW. “That was just a really good atmosphere they had. It was a lot of fun,” said McPhee, who led Mount Rainier High to a state championship appearance as a senior in the 2013-14 season. In the four years since she left home for college at Stanford, McPhee has established herself as one of the premier basketball players in the country. As a two-time All-Pac-12 selection, she leads the Cardinals in scoring this season, averaging 18.5 points per game, and is hoping to help Stanford clinch its 13th Pac-12 tournament title in the last 16 years. McPhee’s senior season started slow because she was hampered by a stress fracture in her foot that forced her to sit out about 10 games at the start of the year. But McPhee’s return to the lineup helped a young Stanford team find its identity after uncharacteristically losing four of six games in a down stretch between November and December. “We had a lot of new players playing a lot, so (we were just) figuring out team chemistry – what works and what doesn’t,” McPhee said. By the time the Cardinal hit their Pac-12 slate, they’d ironed out the kinks. As Stanford showed Friday night in its 69-59 quarterfinals win over USC, some of those young players have stepped up in big ways. With USC’s Aliyah Mazyck playing tight defense on McPhee, the Cardinal turned to freshman Kiana Williams and sophomore DiJonai Carrington to provide an offensive spark. 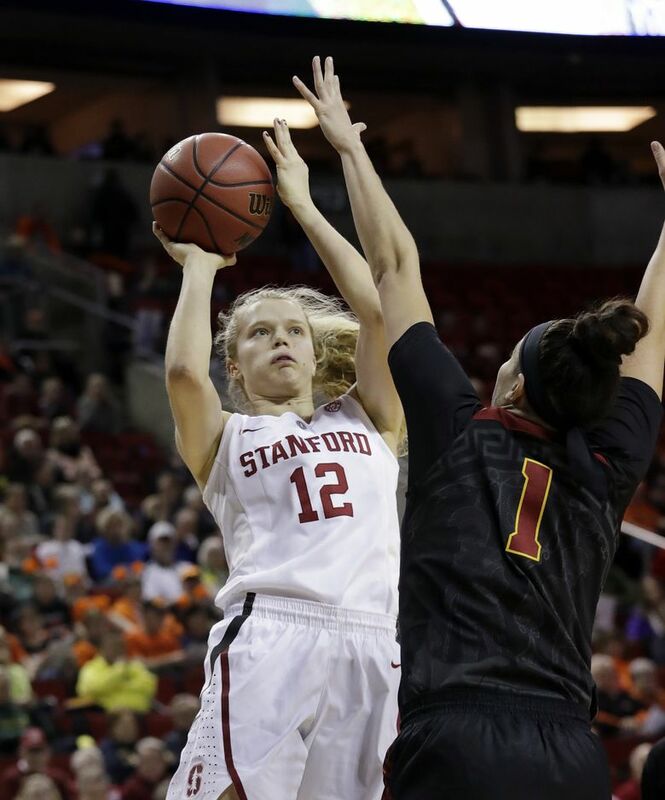 Williams led Stanford in scoring with 18 points, while Carrington scored 13 off the bench. “I thought Britt battled,” said Stanford coach Tara VanDerveer. “I thought the best thing that Britt did was she didn’t try to do too much. She had three assists, which was good. When she got people on her, she looked for open teammates. She had some real nice passes. With its quarterfinal win over USC on Friday, the Cardinal improved to 41-4 all time in the Pac-12 Tournament, and has won 12 of the 16 titles. McPhee scored seven points on 2 of 7 shooting, with her most of her family in the audience at KeyArena though, her fraternal twin sister, Jordan McPhee wasn’t there because she’s in Alaska playing in the semifinals of the GNAC tournament with the Seattle Pacific basketball team. Even though the McPhee sisters ended up going to college 800 miles apart, Brittany says they’ve stayed close and talk every day. Living apart throughout their college careers has “taught us how much we want to be reconnected and live closer to each other going forward,” McPhee said. Can UCLA take down the red-hot Ducks? The Bruins’ 77-74 win over Cal sets up a rematch of the epic Oregon-UCLA game that went to overtime on Feb. 19, and that Oregon eventually won 101-94. So what do the Bruins expect from the pending rematch, with a berth in the Pac-12 tournament final on the line? “How cool is that?… We’ve obviously had two really great games in the regular season and have lots to play for. It’s a real privilege,” said UCLA coach Cori Close. “Oregon is a really good basketball team. I think both teams are really poised to make really deep runs in the NCAA tournament. But we have a very competitive group. Oregon showed Friday just how dangerous it can be with a 84-47 drubbing of Colorado. 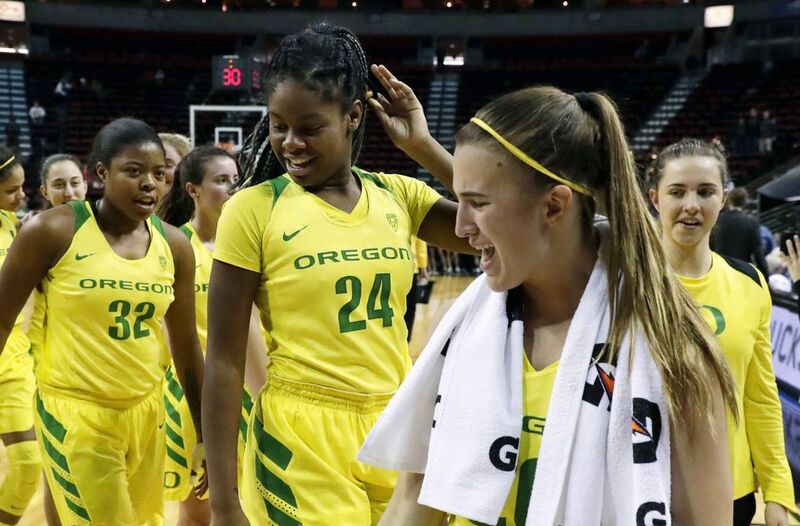 The Ducks opened the second half by hitting their first 10 shots from the field, and two Ducks – Sabrina Ionescu and Ruthy Hebard – finished with double-doubles. Senior guard Lexi Bando got hot from the 3-point arc and sank six of her nine 3-point attempts to finish with 19 points. Oregon’s 37-point margin of victory was the third-most in tournament history, and the Pac-12’s regular season champions are proving that they’re the team to beat in this tournament. Graves said he was particularly happy was how his team has learned to keep its focus for four full quarters. “This team is maturing right before our eyes,” Graves said. “One of our weaknesses has been to build a lead and just kind of play around and not go for the jugular, so to speak.